We started the game with +Tim Shorts talking about a new character – a High-Elf Wizard with CON 18 and CHA 6. He also rolled HP and true to form, rolled a 5 and a 6 on 4d6 for extra HP . . . dang it! He took the average instead. We started with a not-so-brief digression on the strengths and weaknesses of various systems. I won’t repeat that here. We get started reminding ourselves what we’re doing. 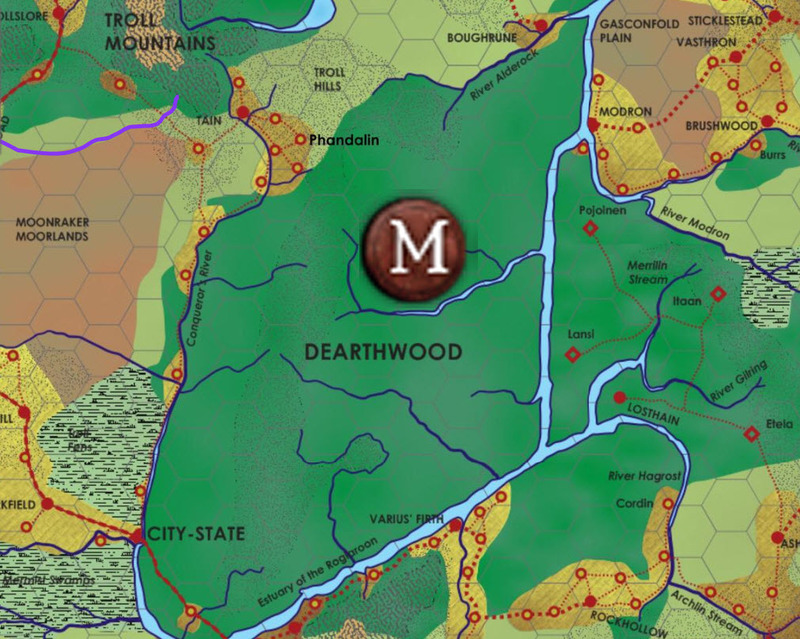 M is the demesne of Mori the dragon. The E is the elven land of Loshain, and the H is the halfling land of the Limerick Shire. We ask Maud if Mori lives near the river; she says it’s dangerous to go down there due to . . . dragon turtles? The river plan is modified to accommodate not getting eaten. Oh, and he was scarred by a dragon, thus the CHA 6. Back when Pan Caulderax was a younger dragon, he took issue with some questions he asked. But he’s made a lifelong study of dragons – he gestures to a table piled high with books. Huh. Guess you’ll need a horse. No, I’ve got a cart that I wheel behind me, called the Gurpscart in my language. So we pick up a 5th level wizard that knows a crap ton about dragons and the local environment. We gain knowledge of outposts and “taighs,” (similar to the Taig from Moon’s Paksenarrion series). 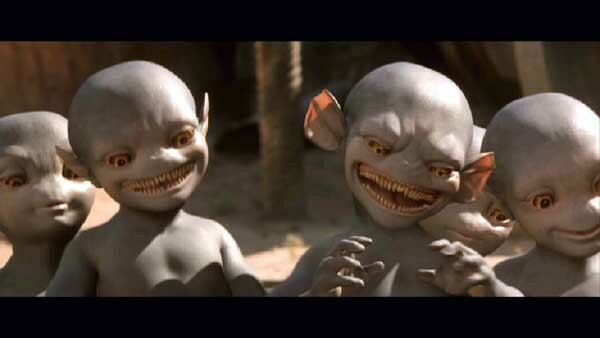 The Taigh (tay-guh) is a magical construct created by the Elves to protect their sylvan realms. The heart of a taigh is a permanently rooted Treant (12 HD). The boundary of the taigh can be miles in diameter and consists of a hedge several hundred yards in depth. The hedge boundary acts as a entangle spell against any intruder. Saving throws are at +5 difficulty. Failed saves result in the target being entangled and unable to move. If the saving throw is made the target can move at one-quarter speed. The Taigh can sense the location of anybody within its bounds and can communicate telepathically with them. It can also read minds and intent. In addition to elves, a taigh’s inhabitants include many other sylvan creatures such as treants, centaurs, satyrs, nymphs, and dryads. A typical taigh grows 1 mile in diameter for every century of age. The taigh abilities disappear if the central treant is killed. In the case of severe injury the taigh will put itself in a deep slumber until it fully heals many centuries later, its protective powers limited to a few hundred yards around the central treant. Each hex can normally be crossed in an hour or so, so each big hex can be crossed at a rate of three hexes in four hours. We figure five days out, five days back, and a buffer for survival. Two weeks rations and whatnot are needed; we can probably stretch that by hunting, 5d per day for trail rations; 20d for dried rations. Per person. So 420 silver for two weeks for a party of six. Sold; they should keep for a month. As we’re waiting, there’s a commotion and a curse. Some huge horse – a true warhorse – is standing around looking indignant. He’s decked out in the colors of Veritas, and he’s looking pissed off that I haven’t found him yet. Since a fully-trained warhorse is like having an Audi R8 show up at the door, we decide that it’s better than Find Steed. Hooves. Melee Weapon Attack: +4 to hit, reach 5 ft., one target. Hit: 2d6 + 4 bludgeoning damage. We find a ship headed south, but we’re only going 15 miles; he wants 100sp to take us the 15 miles, which is reasonable. We mount up and head out. We reach the outpost by noon. It’s got a waterfall, it’s nestled into a cliff, and they drop us off at a beach. Orius, our new mage, leads us on. He goes around a rocky outcropping, and there are hidden stone steps, guarded by three elven archers staring down at us. They are properly snooty, and we exchange banter about the relative worth (or lack thereof) of half-elves and whether such are properly faithful when called to the High Lord. I engage in some very non-Paladin-like insult-trading with our non-host, since we’re blindfolded, mistrusted, and insulted along the way. We travel through the woods from outpost to Taigh, and the GM calls for Perception checks all around; even the new warhorse makes one. We see two black panther-like creatures with tentacles sprouting from their bodies appear out of nowhere. 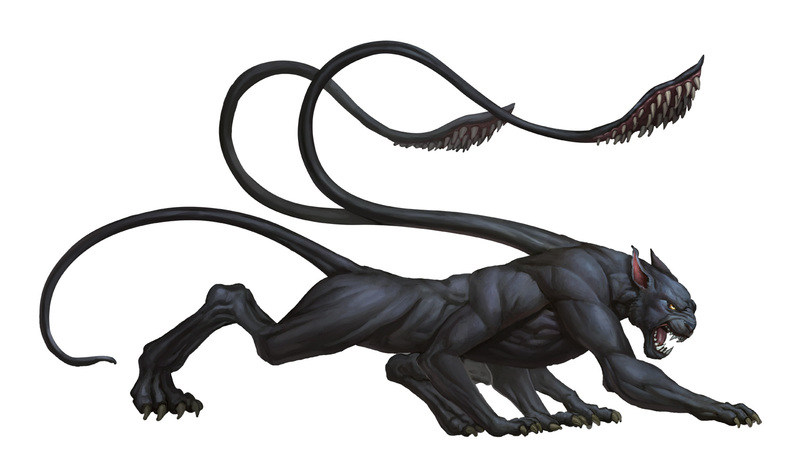 The displacer beasts attack Carmina and Colin; Carmina’s hit once for 5 HP bludgeoning, and 6 HP of piercing. Colin is missed twice; the tentacle swings around and hits himself in the face. Orius casts True Strike on Marcus; Carmina uses his Action to disengage and move. Colin casts Speak with Animals, and challenges the displacer beasts and warns them away. They reply that they’re hungry, and we’re their meal.The illusions that the displacer beasts cast give us disadvantage. Keyar rolls a 24 for initiative, and he goes first, missing. The displacer beasts attack Colin and Marcus; they miss. 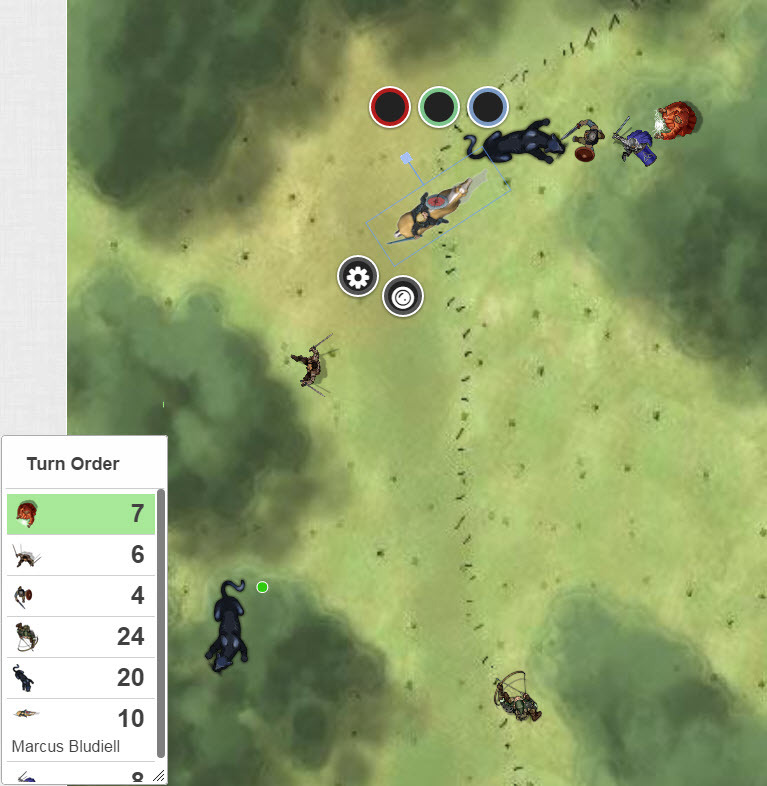 Marcus disengages from his target (two attacks of opportunity miss), and charges over 100′ to hit the second beast twice for 21 points of damage. The beast seems annoyed, but hitting it means that the disadvantage caused by the displacer effect is negated. Orius flings a fireball at the displacer beast; the thing makes it’s check vs DC 16, and blinks out of the blast, taking no damage. Colin says to the beast “It’s a pity you have chosen a predator for prey!” and attacks. Vognur hits the near kitty with a magic missile, and moves between the creature and Carmina. Keyar hits the recently-wounded beast with both Hunter’s Mark and Collossus Slayer, he hits twice, despite disadvantage, for a total of 37 HP of damage. 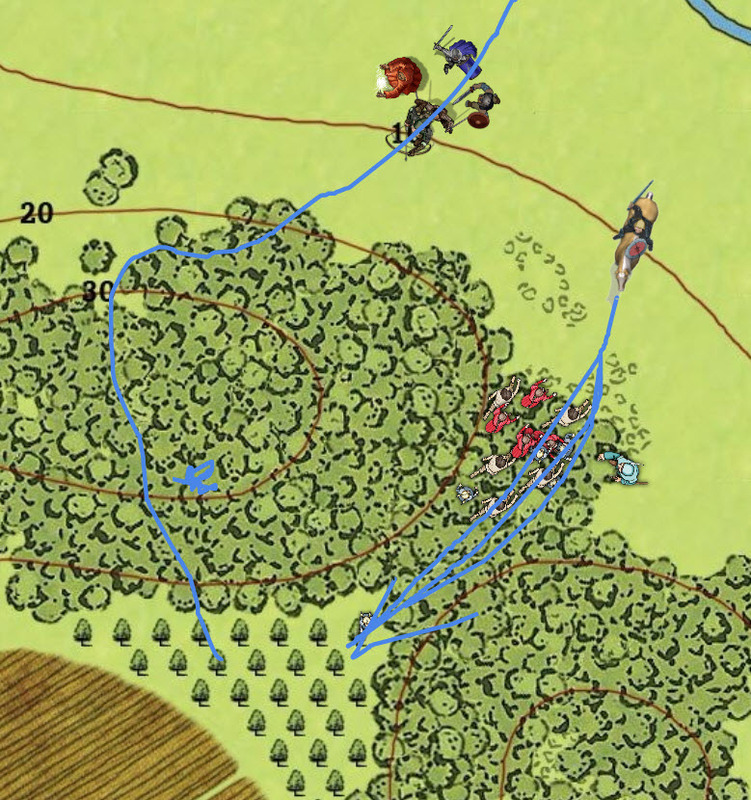 He flees, and triggers two opportunity attacks, one each from Marcus and Colin, for 20 HP more. Still not incapacitated! 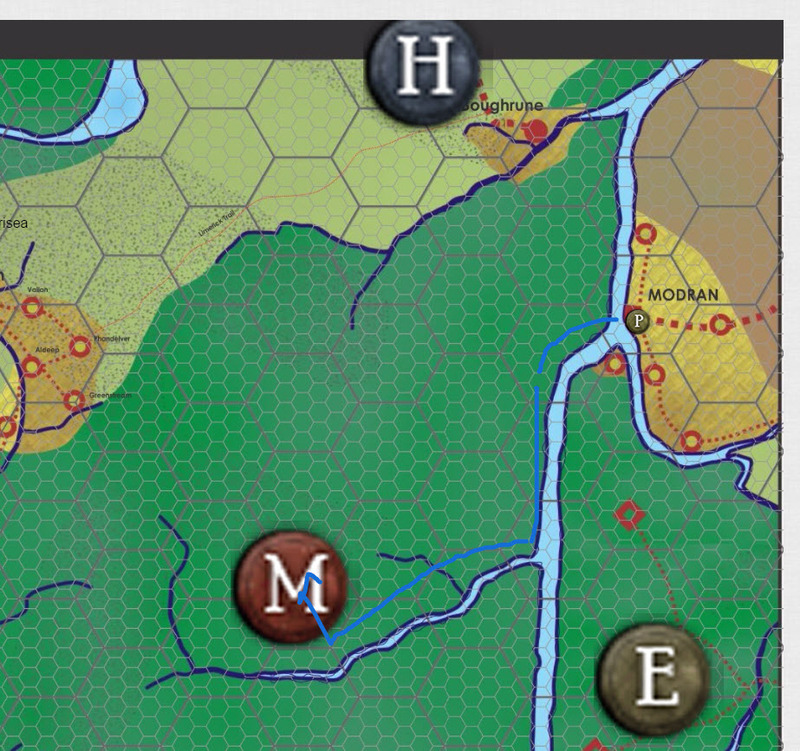 Vognur takes a hit, but not bad – 15 HP; Carmina heals him up with a Cure Light Wounds. Marcus wheels his horse and strikes with his lance for a few HP; nothing much, but enough to neutralize the displacer’s disadvantage-inflicting illusion. Orius hits Marcus with another True Strike cantrip, granting advantage next turn on his first attack. Colin hits the displacer with Viscous Mockery (yes, that’s a real spell) for 3 HP of psychic damage. Vognur uses his magical sword on the local target, hitting for 20 HP. Keyar fells the fleeing beast with a critical hit, then hits the other. Marcus and the rest of the team kill the second one, but Marcus has to expend a spell slot to do it. Two displacer hides worth 200d each can be harvested, plus one viz off of each one; the pelt can be made, perhaps, into a displacer cloak. The viz substitutes for a 1st level spell slot, or 100d (or so) towards creating a magical item. We also get 20 man-days of rations through careful butchery. You have disadvantage while trying to eat them, though. Usually displacer beast meat, as a predator, is not terribly savory or palatable, but Keyar knows how to butcher them up just right, so it’s not bad. It’s not good either, but no worse than the rations we have, and we effectively just picked up three days of extra food. We keep going, and an hour before sundown, we see a copse of trees on a hill in the woods. There are remnants of an orchard and a vinyard. Scouting ahead, Keyar sees perhaps 20 children and an elder, crowded around a cooking fire. We also see six fresh scarecrows in the field. The children all look pretty gaunt; they’ve not had much to eat. The grandfather-type looks to be a very, very old elf. The kids look human. We start hypothesizing that these guys are eating corrupted food from the Taigh, when evil creatures move in, the land no longer is vital. The scarecrows usually indicate a hag; the children take on a visage of innocence, but they may well be minions of a hag. Marcus uses Detect Evil, and oh, yeah. There’s evil up there. If we could clear this out, the elves would look upon this favorably, and be able to bring this back. Marcus decides to clear this clutch of evil out. We give Orius the Staff of Defense and the Wand of Magic Missiles as a “welcome to the team” present. Colin remembers. A long time ago, there was a last stand in this forest to protect some children. We believe it was unsuccessful. But the faeries are emotions incarnate; the children may well be faeries that are the remnants of the slain. The elf may have gathered to him the members of the unseelie court that may cause problems, like the restless spirits of the children. We also suspect there’s a hag in the middle of the clearing. We move forward, trying to effectively draw fire and detect evil by moving closer to the cluster of fae/elves. We hear a screech and scream, and all the children are suddenly running oout of the woods liek they’re fleeing in terror. The grandfather elf is being attacked by two of the scarecrows, which are now ambulatory. We totally saw that coming. We end there, since it’s getting on to night time. We got 500 XP each. Not too much treasure, but a lot of movement (both literally and plot-wise). Next Next post: Majestic Wilderlands – When Scarecrows Attack!
"" a High-Elf Wizard with CON 18 and CHA 6. I'm not going to play him mean; I'm going to play him ugly." Heh. Charisma in D&D is kind of fun for the way it can be interpreted. Had fun with one character who I described as "beautiful … but with a terrible personality and grating voice."